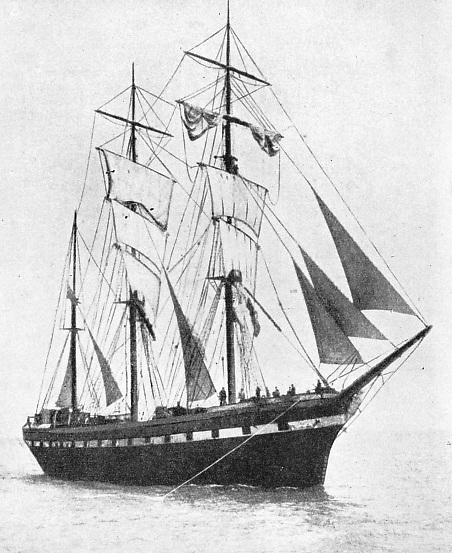 ONE OF THE MOST BEAUTIFUL OF THE LATER SAILING SHIPS to fly the American flag, the Dirigo, had a bad reputation among sailors. 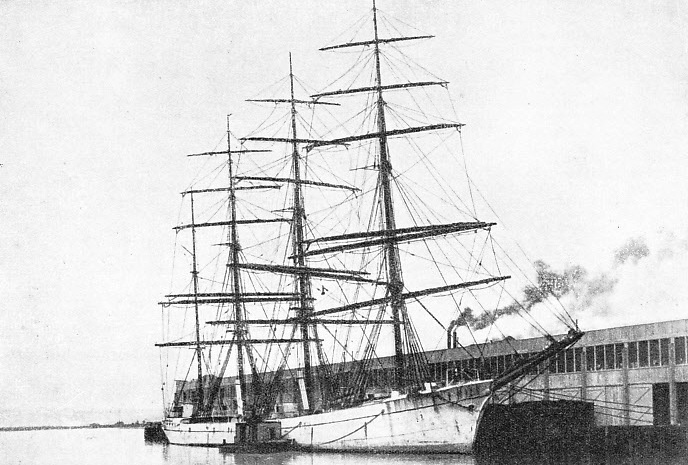 This ill-famed ship was the original of Jack London’s famous “Hell Ship”. THE worst blot on the fair history of sail, which contains so many magnificent chapters, is the unnecessary brutality found in so many of the old ships, even in some of the best whose names come down to us as examples of all that was finest in the old school. Nowadays “bucko mates”, “hard-case skippers”, “blood boats” and “hell ships” are often treated as romantic; but in the days when they existed there was little romance about them. The toll of life and happiness which they took was terrible, and it is often difficult to understand the brutality of many officers who were otherwise possessed of fine qualities. But the fact remains that cruelty, after it had been checked on land by law and public opinion, remained a normal factor of sea life for many years. A good deal of the hardship was formerly regarded as unavoidable and inseparable from the design of many ships; this design, however, could easily have been modified, and there were numbers of owners who were always well ahead of the law. The trouble was mostly in the position and design of the forecastle. It was right up in the eyes of the ship, with the hawse-pipes running through it to the windlass below deck, and these could not be properly plugged when the anchors were unshackled. The men lived in water, and the waste of life by sickness was terrible. There was seldom any opportunity of drying clothes except at the galley fire, and the men were often refused permission to make use of that for no better reason than that it was “coddling” them. Comparatively few forecastles were properly fitted with artificial light and heat. Moreover, the ventilation that is considered so important nowadays did not matter then; the sailor hated ventilation, and took the first opportunity of blocking up any ventilators provided. On the other hand, he naturally felt bitter when he saw his meal, when on its way from the galley to the forecastle, carried overboard by a big wave. He was ravenously hungry, and knew perfectly well that the meal would not be replaced. The whole of the victualling system in nine sailing ships out of ten would be regarded nowadays as gross cruelty on the part of the owners. To save money many owners would buy stores that had been condemned by the Navy - Gibraltar was a favourite call for the purpose of shipping these - but the special stores supplied were often quite as bad, because the owners would not pay for anything better. The Board of Trade inspection was a farce - as it had to be when food condemned by the Navy was openly sold to merchant ships - and it is no wonder that the men became sullen. Sullenness begets mutiny, mutiny was the offence which the afterguard always dreaded. At a time when punishments on land were harsh, those at sea were made even more brutal. This was done deliberately, for in a small community the least sign of mutiny had to be checked for the safety of all hands. Thus many of the punishments which were officially permitted and even laid down were cruel in the extreme. The cat-o’-nine-tails was used in the Merchant Service nearly as much as in the Navy, and with far less control. For centuries keel-hauling had been a regular proceeding; this meant passing a line from yard-arm to yard-arm and dragging the unfortunate seaman under the bottom of the ship by means of it. He was half drowned in the process, and, if the ship’s bottom were foul with barnacles, as it usually was, he was terribly lacerated in addition. After keel-hauling had been prohibited as barbarous, it was usual for a defaulter to be towed astern on a line. When these punishments were officially prohibited, and in their place the law provided for the offender to be logged and fined so many days’ pay, the captains maintained, with a good deal of truth, that the seaman did not care a button for money that he never saw, and that the new punishments were thus quite useless. With a good deal of misplaced ingenuity, therefore, they evolved some punishments of their own. In addition to maintaining discipline and checking any tendency to mutiny, the officers of the average old-time sailing ships were obliged to teach the greenhorns seamanship. Practically every sailing vessel carried a considerable proportion of first voyagers, admittedly or under a cloak, when she put to sea. It was the tradition that these landsmen should be made seamen before the end of the voyage, so that the method depended very largely on the route of the ship. On the long run to China or to Australia there was plenty of time, and, weather permitting, methods of some reason could be employed; but there was little time in one of the clipper packet’s dashes across the Atlantic, and intensive methods were the rule. These intensive methods consisted of every kind of brutality to an under-running accompaniment of the foulest language. The brutal methods frequently won for their ships an appalling reputation, but it must be remembered that the officers had many difficulties to face. Moreover, they were always aware that a poor seaman could easily imperil the safety of the ship and the lives of those on board. The “packet rats” who largely manned these transatlantic clippers were invariably mutinous. At one end the clippers shipped the toughest crew of Liverpool Irishmen, and at the other end a sprinkling of New York gangsters. Long before newspapers and films made the world familiar with the American gangster, there existed the gangs of the New York water-front. These gangs, which were employed by the crimps and sailors’ boarding-houses, included a fair number of seamen who went for a voyage when it suited them, or when they were forced by circumstances. There were always sham seamen attempting to work their way across to the U.S.A, where they had every intention of deserting; these were known by the generic name of “Paddy Westers”. They were among the officers’ greatest curses; the “packet rats” were at least seamen who could be relied upon in an emergency. The “Paddy Westers” were called after an Irishman, Paddy West, keeper of a low type of seamen’s boarding-house in Liverpool, who had a strain of humour in his composition. A stickler for truth, he installed on the table of his tap-room a huge bull’s horn. Every landsman who preserved himself at the boarding-house, desiring to work his passage or to escape from justice, was solemnly marched round this table, so that he could tell the mate who was engaging him that he had been three times round the Horn. He was then boarded until he could be conveniently shipped, and was promised a kit for the voyage. The traditional kit was a top-hat and a dark lantern for a trip round Cape Horn in summer. That, however, the “sailor” did not discover until he was well away. In the meantime, provided with a batch of discharges,- that were faked, stolen or taken from a dead man, he would be shipped as an able-bodied seaman and his advance note would adequately pay Mr. West for his trouble. A large proportion of “Paddy Westers” in a watch, all shipped as qualified able seamen, might well cause a racing clipper, hanging on to her flying kites to the last moment, to be completely dismasted or to founder with all hands. A NOTORIOUS VESSEL, known as the Bloody Gatherer. Her record for the appalling ill-treatment of her men was bad even for San Francisco in the old days of the “Barbary Coast”. Two suicides occurred on one of her voyages. So the packets became notorious for their hard treatment before the steam liners swept them off the Atlantic. The Devonshire was specially noted, even in such bad company. Her captain and second mate worked together in a spirit of absolute ferocity, leaving the first mate, who was a humane man, to his own devices during his watch on deck. A man was lost overboard during the second mate’s watch. There is little doubt that it was an accident, but the American crew had already had enough, and they left the ship in a body in London, accusing the second mate of kicking the unfortunate seaman off the yard-arm during a gale. On their information he was arrested by the London police. The problem of jurisdiction now arose, as the incident had happened in an American ship. The second mate was sent across to New York in custody, and there he was tried; for once the verdict went in accordance with the seamen’s evidence. The man was sentenced to three years for manslaughter. The second mate was probably innocent of the offence, but his sentence was by no means a heavy one for the innumerable brutalities for which he had not formally been charged. This matter of kicking a man off a yard when handling sail at night was a terrible one, and there is no doubt that it happened in more than one ship. It was a particularly brutal and cowardly murder, for if the man were doing his work he had no chance to save himself in a sudden attack, and once in ice-cold water the end was swift. The rest of the hands might suspect, but they could do nothing on a dark night aloft, and hearing was poor evidence; so many men fell from aloft by pure accident. But there was nothing that destroyed the spirit of a forecastle so completely as the suspicion that this had happened. Every time the hands were sent aloft in the dark every man was wondering if his turn were next; that did not improve the performance of a trying job in difficult circumstances. But brutality was not universal even among the packets; some officers made a point of picking their men carefully, treating them well and signing them on again and again. These were happy ships and many of them made conspicuously smart passages. But the gangs ashore were naturally jealous and made every effort to corrupt the men or to slip into the crews sufficient bad characters to start a mutiny. In this they had the help of the crimps - who could not make a living if crews remained in their ships - and often of the police. 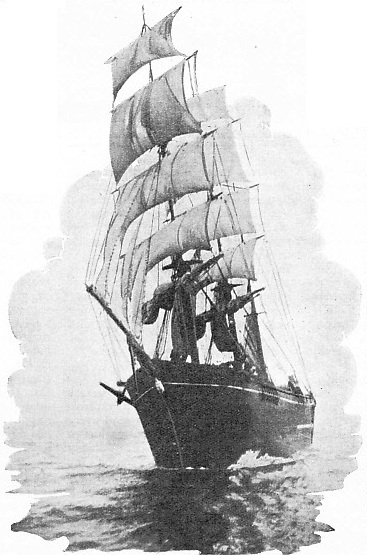 In addition to the packets there were two other types which had an evil reputation, the “Down East Bloodboats,” which ran from the Eastern States to the North Pacific ports, and the “Bluenose Hell Ships”, which hailed from the Maritime Provinces of Canada. Both these types had an evil reputation, as their names suggest; but there is no doubt that in the Canadian ships almost invariably, and in the “Down Easters” generally, the really good seaman who did his job cheerfully and efficiently was immune from any brutality, although he was certainly sworn at thoroughly and frequently. Some officers were, of course, naturally brutal, and there are a number of undeniable instances of deliberate torture; but brutal officers were in the minority. The root of the trouble lay in the fact that most officers regarded the seaman as thoroughly bad, born lazy and always ready to take advantage of the least weakness, and that it was their duty to the owners to treat him in the same manner as slave-owners treated the negroes ashore. Many of the harshest officers were conspicuously loyal to their employers and ships. They regarded the hardest possible work as the best policy for checking grumbling and dissatisfaction among the forecastle crowd. With this idea in view they found any number of unnecessary tasks, especially during the men’s watch below, when they had the right to rest. Brass yard-arms which had to be polished daily, even in the bitter cold and grave danger of a howling gale off Cape Horn, have been known to have been specially fitted for this purpose. When the seamen were finally irritated beyond all self-control they were regarded as mutinous dogs, and the harshest treatment was held to be justified. NO RECORD OF BRUTALITY was associated with the Antiope, but she had such an extraordinary reputation as a man-killer by every kind of accident that the sailor dreaded her and called her the Anti-’ope. It was entirely through a mistaken idea of the owner’s interests, and seldom to help themselves, that the officers would deliberately “haze” a crew, “work the very soul-case out of them”, giving them no peace morning, noon or night, until in desperation they went over the side at the first opportunity, and deserted in a body. No effort would be made to fetch them back for punishment. It paid better to have the ship manned by the apprentices only if she were to be in port for a long time; when she was ready to sail it was generally easy to get fresh hands through the crimps. These men wanted to be well paid, it is true, but their pay came out of their advance notes, so that the owner was seldom out of pocket. The policy was calculated to guard against the danger of idle hands in port getting into mischief, as well as to save money for the owners. But, with men who were sufficiently far-sighted to realize what they were sacrificing in accrued pay, the “hazing” often had to be particularly brutal before they finally gave way and ran. When the law was changed and the pay which the men had earned, but could not draw, no longer went into the shipowners’ pockets the “hazing” policy was not so popular. Another instance of brutal treatment forced on the officers by the supposed interest of the owners was in the shipping of seamen who were willing to take a berth at far below the normal rate of pay. Such crews generally consisted entirely of foreigners, with a large proportion of gaol-birds of the worst character, and they had to be manhandled if they were to be kept at work at all. Any honest man who found his way into such a crew had reason to regret his action. A terrible example of the result of such a policy is that of the British ship Lennie in 1875, which, to save her owner’s money, shipped a crew which were the sweepings of Antwerp. The crew included four Greeks, three Turks, one Austrian, one Dane and one alleged Englishman, with a Belgian and a Dutch boy in the steward’s department. The British officers treated this crowd with consideration and strict justice, but they mutinied and every man in the afterguard was murdered, only the gallantry of the Belgian steward and the Dutch boy bringing the mutineers to justice. Within a year or so the public was shocked by the similar instance of the British ship Caswell. But Captain Best of the Caswell was undoubtedly a brute, and he did his best to drive his crew to mutiny, although there is every evidence that mutiny had been intended from the beginning. The American sailing ship captains of the better type always made a particular point of leaving manhandling to their mates, although many of them had the reputation of having done it efficiently enough in their young days. British masters were more inclined to take action themselves. The title “bully”, borne by many American and British captains, was not always intended as an epithet, although it often was. “Bully” Waterman once shot a wretched seaman who was helpless with frostbitten feet. “Bully” Hayes was a scoundrel who mixed slaving with murder and was himself murdered; but “Bully” Pattman, “Bully” Martin and many others were just “hard cases” under whom real seamen were proud to have served and about whom they told dog-watch yarns for years afterwards. The mates were generally worse than the masters. Perhaps the worst type of “bucko mate” was the man disappointed of his command through a reputation for unreliability because of drink. There were many of them in the old sailing ship days, often fine seamen, although they generally went to pieces in the end. The wise seaman kept clear of any ship in which they were sailing. Every sailing ship, no matter how peaceful and well run, carried, as a natural precaution, sufficient firearms for her officers at least. 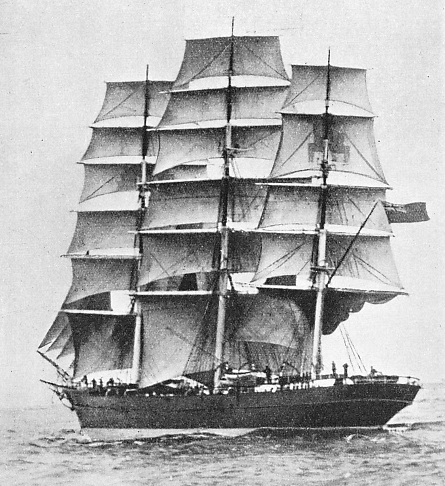 UNDER SAIL AND AT ANCHOR. 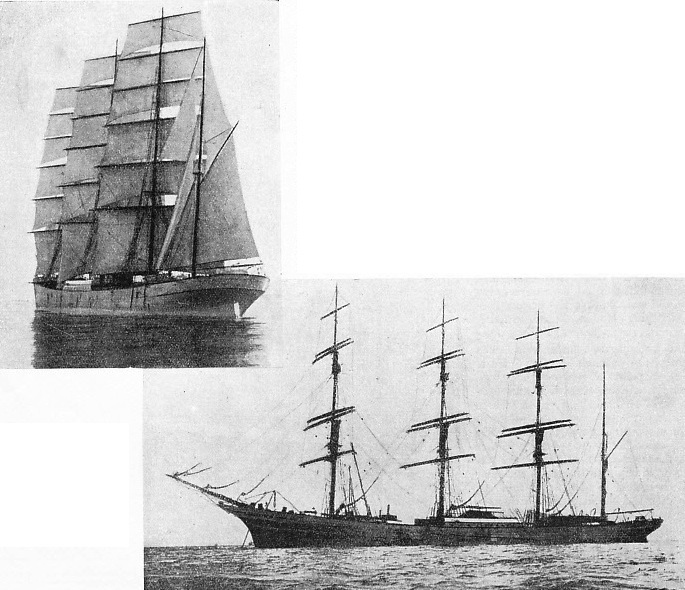 Two photographs of the James Kerr, a ship the memory of which is revered for the sake of Captain Powles, enthusiastic musician and sportsman, whose early influence was felt by many of his apprentices throughout their lives. But the American “bucko mate”, having to deal with a rough forecastle crowd, invariably went on watch with knuckle-dusters on both hands. The belaying pin, either metal or hardwood, made an effective weapon, Tales would often be told of adroit mates who could kick a belaying pin out of the fife-rail, catch it in the air, and lay out a mutinous seaman practically instantaneously. Such tales have to be accepted with a good deal of scepticism, although many mates certainly made a practice of going on watch with a belaying pin tucked in either half-boot. Perhaps the most brutal weapon of all, undeniably used in some ships, was a 3-ft wooden “bat” similar to that used by the smugglers, but having a long nail driven through the end. At the best, wounds caused by this weapon festered in the conditions of a sailing ship’s forecastle, but in many instances it went right through a man’s skull and killed him. Such a weapon could not be considered on land, but while the ship was at sea the precautions against mutiny were carried to excess; all the power was in the hands of the officers to abuse as they saw fit. The only redress that the seamen could obtain was by lodging a complaint in proper form when the ship was in port, and this they were generally unwilling to do. For one thing, they knew they had little chance of success. If the complaint were lodged at a port of call in the middle of a voyage it generally had to go before the British Consul. He was almost invariably a local business man dependent on the ship and her owners for his living, so that he was unlikely to give judgment in favour of the men. If their complaint was dismissed they could be assured of a terrible time for the rest of the voyage. If they waited until the voyage was over, when they could no longer be penalized, they generally forgot all about their grievances after the first few hours of unlimited liquor on their pay day. Occasionally they would take justice into their own hands and the captain or mate would find himself in the dock one dark night; but as a general rule the men forgot. If it appeared obvious that the case would come before a court, the captain or officer concerned could generally arrange his escape by tug before the men could get ashore to lodge their complaint. This was often done with the connivance of the Customs and the police, and it certainly saved many a condemnation for murder or manslaughter. If the case did come before the courts it was often easy enough to buy a packed jury. If that failed, a financial arrangement with the local crimps would ensure that all the hostile sailor witnesses were shanghaied and shipped off for a long voyage, when the case would be dismissed for lack of evidence. But there were many instances of bullies receiving their deserts, even in the United States, where the officers were popularly supposed to have it all their own way. The “Down Easter” Gatherer, a ship with an evil reputation, had two suicides in one voyage, which was too much even for San Franciscan opinion in the ‘seventies. One Scandinavian went mad because of the cruelty of the mate and dived off the royal yard, and an American cut his throat on the taffrail and jumped overboard afterwards. One seaman was shot dead by the mate on the same voyage. Finally, Captain Sparks was hounded out of his command, and his mate Watts received a sharp term of imprisonment. The “Floating Homes” were not nearly so conspicuous as the “Hell Ships” - in most instances they escape attention from the historians altogether. There were no newspaper reports concerning them, and no headlines on striking court cases; but where the sail-trained seamen forgather the “floating homes” are spoken of with affection after a lapse of as much as half a century; the impressions formed during apprenticeship will last a lifetime. THE BRENDA was a floating home under Captain “Jamie” Learmont, who always had his wife on board and took the greatest care to teach his apprentices all that he possibly could - if they did not smoke. Many captains and many owners attempted to make their ships comfortable and happy for the men and boys who were serving in them, but they were not always successful. 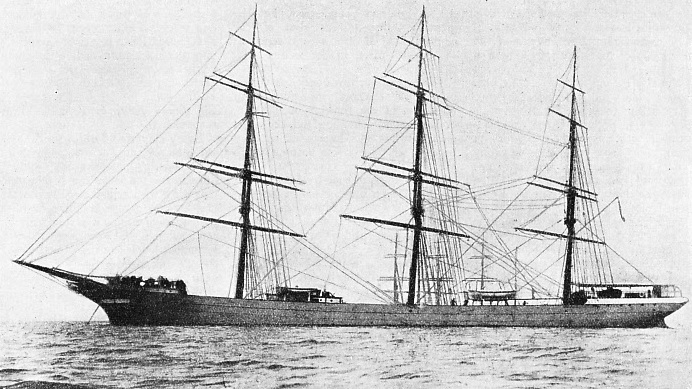 The classic instance is that of the Inchgreen, built in 1877, for which the owners provided a deckhouse forecastle with two-berths cabins for the men, basins to wash in, curtains to the bunks, mirrors on the bulkheads, and crockery from which they could have their meals in comfort in the mess rooms provided. As an offset to this, they expected the men to sign on for less than the standard rates of pay, and that may have been the reason why the experiment was a complete failure. Men who had served in the ship for one voyage did not sign on again, and what was worse, they stole every fitting to pawn for drink while they were in port. This unhappy experiment was constantly quoted as an example by those who were unwilling to spend the money to make their ships comfortable and happy. For one thing, of course, with a conservative mind such as that of a seaman it is necessary to make such reforms gradually. It was firmly implanted in the heads of the men that there was no kindness about the matter; that these reforms were made merely to secure the small reduction in the rates of pay. But there is no doubt that plain features which were introduced into ship design without such advertisement, for the purpose of securing greater comfort, were appreciated at once. But it was the personal side that counted for infinitely more in making a happy ship than any material considerations that could be planned by the owners. All the officers contributed, but the greatest influence was that of the captain and, if she were carried, as she was so often in the sailing ship, the captain’s wife. Unfortunately, it was only one woman in a dozen who was successful; if she interfered in the working of the ship, or overshadowed her husband, the vessel became what was known as a “hen frigate”, and there was nothing which the sailor hated as much. There are many instances of such a vessel coming to grief for no other reason than that the captain’s wife was interfering in her management, or that she had put all hands so much on edge that they became demoralized. But when she happened to be a real seawoman, possessing tact and kindness in equal measure, she was offered a whole-hearted devotion from every man on board. She influenced the life of the apprentices more than anybody else, and would still be mentioned with reverence when the boys that she had befriended in the half deck had risen to the command of giant liners. Happily there were many such in the latter days of sail, invariably married to a captain who was a real sailor himself and who was able to base his kindness on a foundation of respect. To mention only the more prominent whose names come to the mind of the older generation of shellback, Captain T. Y. Powles, who ended his sea career in the James Kerr, in 1902, is always remembered. Every ship that Powles commanded was a happy one; he was a musician to his finger-tips and he would teach the apprentices music or run a dog-watch sing-song with equal zest. He was a thorough sportsman and, in spite of the difficulties of raising a cricket team in a sailing ship, he did so with great success, arranging some splendid matches in Australia and elsewhere. In another “floating home”, the Brenda, and later in the Bengairn, Captain “Jamie” Learmont and his wife were real parents to the apprentices. He insisted on discipline, and one of his little fads was that no half-deck lad should smoke until his time was out. But he had infinite patience in teaching them all that there was to be learned in a seaman’s craft, and concerts round the saloon piano, the skipper’s young children who sailed with him supplying the chorus, were a great attraction to an apprentice who was apt to be homesick, and find a seafaring life harder than he had imagined. Mrs. Brown, who generally sailed with her husband when he was master of the North Star, worked on the principle that it was best to make the ship resemble the good homes from which the apprentices came as far as was possible in a sailing ship. THE BEAUTIFUL CIMBA was so popular that seamen would accept casual labour in the docks, so that they could be at hand when Captain Holmes was signing on his crew. Captain Tod, the popular master of the Shakespeare, had a wife who was loved by everybody, and the presence of two sunny-natured little daughters on board made a big difference. Perhaps the greatest compliment that was paid to him was that there was not a single desertion from his ship for a period of several years. The numerous apprentices who served their time in the Shakespeare always remember the manner in which they were kept clear of the temptations which generally beset a youngster in port. There was no preaching or strict regulation, but the captain and his wife kept “open ship” for apprentices of all the other ships in harbour. The birthday of an apprentice oil board was never forgotten and - a touch of humanity which meant an immense amount - Mrs. Tod would always celebrate the occasion by begging for “duff” - boiled pudding - with the dinner of all hands in the forecastle as well as the half-deck.